AGI’s LED Deck Edge lighting was developed to improve the visual landing aids available to the approaching Naval Helicopter pilots. The DECK EDGE/STERN DROP/LINE UP LIGHTS are designed to provide the approaching pilot with a clear visual reference as to the limits of the deck area, the stern and approach line-up. AGI’s LED Deck Edge lighting was developed initially to satisfy a UK RN requirement to improve the visual landing aids available to the approaching Naval Helicopter pilots. This innovative design of ‘strip’ lighting was designed to enable pilots to appreciate more efficiently the movement of the flight deck of a vessel, without increasing their mental workload. This has been achieved with significant success and the solution is now being adopted by many navies world-wide. The lighting is compliant for use with Night Vision Devices and therefore allows for both day time and night time operations. 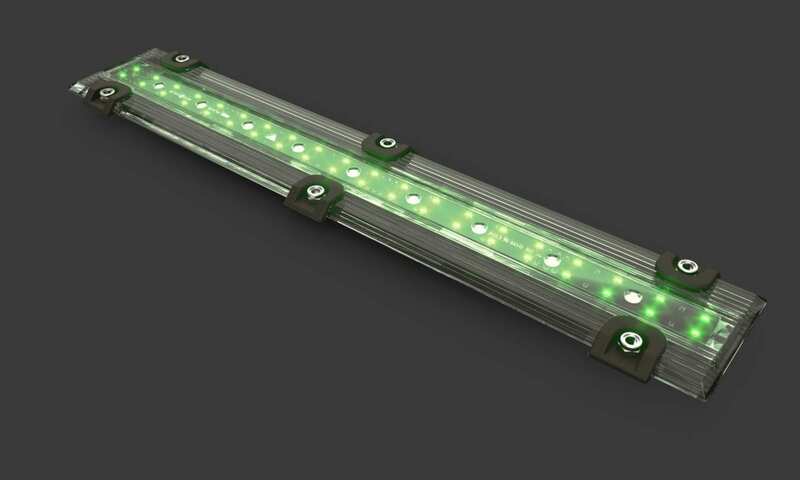 These fully sealed lights are available in a 0.6 metre length, with a clear polycarbonate body, flying lead and having the LED PCB’s potted within the enclosure to ensure the unit is a fully sealed one piece light. The lights also feature ramped edges and a non-slip finish to the surface.